Mirza Ghalib was the pen name of Urdu poet Mirza Asadullah Baig Khan who was born in colonial India in 1797. Considered one of the most popular and influential poets of the later days of the Persian Mughal Era before British rule took full hold, he wrote several ghazals – poetic forms that incorporate rhyming couplets with a refrain, each line sharing the same meter. 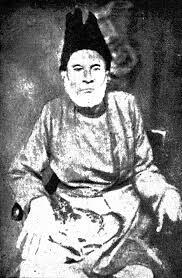 When he was 13, Ghalib married Umrao Begum, according to Muslim tradition, and moved to Dehli, a period that was marked by personal tragedy. Ghalib and Umrao had 7 children but none survived beyond infancy. Throughout his poetry there is a central theme about imprisonment and the painful struggle of life and Ghalib went on to describe his marriage a second form of imprisonment. While his wife was generally pious and Godly, Ghalib was a little more unfettered, put in gaol on one occasion for gambling and acquiring a reputation as a ladies man in Mughal court circles. He has always been considered something of liberal mystic who was mistrustful of the literal interpretation of the teachings of Islam and other religions. Poetry was a love from an early age. He composed his first poem at 11 and learned philosophy and logic in his late teens and brought this into his work, exploring issues such as the mysteries of life through numerous ghazals, which until then had been primarily used to express thoughts of love. Although he was most connected to his Persian poetry, it was his Urdu verses that have lasted the test of time and are still sung and recited in modern day India and Pakistan. His work has been studied and written about by Urdu scholars across the years and the first complete English translation of his work was in The Love Sonnets of Ghalib by Dr Sarfaraz Niazi which was only recently published. As a writer, Ghalib also chronicled a very turbulent period in Indian history and his letters provide a deep insight into the great changes that were taking place with the rise of colonialism and the end of the feudal elite. Like many religious poets, both then and now, Ghalib was able to write profound pieces but also used verse to criticize many aspects of orthodox religion particularly the arrogance of certainty that many religious leaders were guilty of during the time. Often difficult to understand, especially in its English translation, in contrast Ghalib’s work brought about a revolution in Urdu literature, introducing a simplified, conversational style of prose. Ghalib died in Dehli in 1869 at the age of 72. His fame grew after his death and over the years many films, plays and books have been produced about his work and poetry.